Even though I enjoy shopping and I like buying things that I want when I can, I do try to save money and one of the ways I’ve discovered that helps me save is using coupons and promo codes. 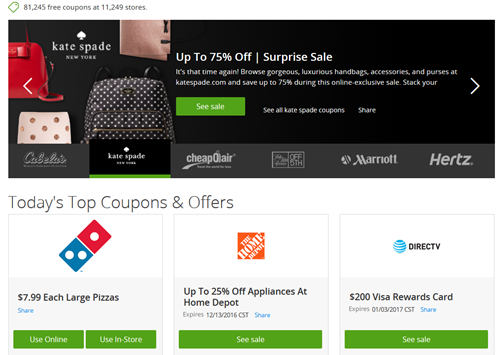 A great way to find deals, for both online and off, is the Groupon Coupons site. With thousands of promo codes and printable coupons, you can find discounts at thousands of stores! Just looking at the list of deals and coupons available with inspire you to find the perfect gift idea or item to treat yourself with! For example, you can stock up on prints and photo gifts with coupon codes for Shutterfly and buy yourself some colder weather items at Nordstrom with 40% off! Here are more ways to save money each month! I definitely recommend checking out Groupon Coupons before making purchases online or before heading out to shop!